The office is deserted except for me so I’ve got 40 minutes to try to write something interesting. 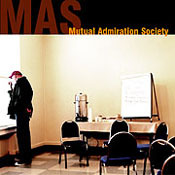 I’m sitting here listening to my Mutual Admiration Society CD I finally got in the mail yesterday. Good things come to those who wait. I won’t bore you with the differences in the songs from this recording back several years ago, to tour today but they’re pretty big. And for the record, it’s now under a month till the Nickel Creek concert in Ohio. I know that everyone has been just as concerned about that as I have. I really hate it when someone calls to ask you for something and they proceed to act all conversational as if I don’t know the ulterior motive for the phone call. I’d much rather we just skip the niceties, and go right to what they’re asking for. Don’t try to placate me or waste time pretending that you’re interested in what I have to say. Don’t try to think of some far-fetched excuse to call when in actuality you just didn’t want to admit to the question right away that what you want is not in the least to talk to me. I had one of those conversations this week. It bugged me b/c I don’t think he had a clue that I saw right through the reason for the call. Or maybe he just didn’t care. Either way, next time I’m not going to be nice. Oh who am I kidding? So with this new job I have to walk down to the bank every day. It’s about 5 blocks or so and is a really nice walk b/c it’s to the circle which always has something going on. I’ve realized something about bankers. Maybe I should chat with Kev about it. Why is it that they feel the need to stamp your deposit slips as if it takes 50 lbs of pressure to get the stamp pad to work. Are your stamp pads that weak? And if they are, you’re a bank for the love, buy yourself a new one. They’ve just so harsh and deliberate with it as if to say- I am the strong stamping bank man out to take your money. Or at least that’s what I think of when I see my banker. Yeah, I should definitely ask Kevin about that. Ok, I know that I haven’t really written much of anything important lately. I’ll try to find a computer next time I’m feeling a little more pensive than I have as of late. My apologies. Public Service Announcement: If any of you are Glen Phillips and/or Nickel Creek fans- be sure to pick up the Mutual Admiration Society in stores tomorrow. It's got the best version of Windmills I've ever heard. And come on, it's Glen and NC- what more do I have to say?! There's nothing better than knowing when you get home after work you're going to have new music in your mailbox. Or at least it'll be there today or tomorrow. Not to mention it being a CD that was recorded several years ago but is just now being released. Few things make me happier than new music- and if it includes Nickel Creek, it's pretty near untoppable. Veruca sweetheard, I'm not a magician. I listened to one of the coolest things in the world this past weekend. Granted Ems may be the only reader here who fully appreciates it just b/c she knows of my obsession (and b/c we’ve seen the show together 3 times now…) Alas I digress, I listened this weekend to the original tapes from the workshop version of RENT 2 years before it ever made it to Broadway. They were the actual tapes that Jonathan Larson sent to this theatre bigwig who decides whether or not to produce shows. Jamie that I work with is a huge RENT fan too, and when he started working here, Mary, another of my co-workers gave him the tapes. She’d gotten them b/c she’d worked for the theatre bigwig guy that the show was sent to. She’s not so much a RENT fan, so when she found out Jamie was, she gave them to him like it was no big deal. Anyway, it was crazy to listen to b/c compared to what you hear now when listening to RENT- it was pretty bad. Don’t get me wrong, some of it was still good. Some of the songs were just as they are now in the show, other songs didn’t even make it, some lyrically were slightly different, and then there were other random nuances that you’d only notice if you’d listened to the CD enough to have it memorized a million times over. (And it was my constant shower CD at 820, I can still hear Jenny laughing in my head when I’d knock on the wall of the shower during Light My Candle.) Anyway, it was still really amazing to hear what everyone first heard and fell in love with, to what it’s become. I’ll spare you all the details of what was different and what was the same… but for the record it was awesome. I love my job. I know that you’ve probably heard me say that a million times over if you’re someone who talks to me on a semi-regular basis at all, but I just wanted to state again how much I love it. I love the people I work with. I love the people that I deal with. I love that I get excited about coming to work and don’t dread Monday’s as much as I used to. I love that it’s just as obvious to everyone else that I’m a much happier person. Talking to Michael after church on Sunday, he was asking how I was doing, and he just stopped and said “You sure smile a lot more now.” Not that it’s surprising that he noticed. He knew that I’ve been unhappy for a while now. He even told me he’d felt guilty b/c he knew I wasn’t doing what I wanted to do, but at the same time of course wanted me there. I think he probably knew more than most just how restless I felt. He always picked up on things that I never said, frustrations that I never voiced. He’s a good friend to have. I know he’s shocked that I’ve stayed at the church. He’s even told others that. I guess I’ve just found that for now, what I “prefer” in a church, musically and otherwise, isn’t nearly as important as the few people that I really love there. I want to give it a fair chance without working there to see how I feel about it before moving on. I’ve already realized that I enjoy it a lot more when I’m not there 40+ hours during the week. It’s been nice this summer too with JC out on sabbatical. So we’ve heard a lot of different people preach. The last two weeks have been fantastic. In fact, this past Sunday was probably one of the best sermons I’d ever heard. Jeff Vines who’s currently a missionary over in New Zealand. He didn’t use any notes, touched on scriptures from his Bible in hand, and simply told a story. I learn so much better from a narrative point of view than from probably any other method. And it all pretty much stemmed around apologetics- but it wasn’t the apologetics of this many people saw Jesus… it was more of think of evil and good this way- anyway, it was great. I love going to service and not knowing everything we’re singing ahead of time or exactly what the sermon says before I ever hear it preached. Nice change. I guess I really haven’t updated at all about California. It was great once we finally got there. We had some ticket issues- God bless Alys- but we got there and once the sun came out we were happy. It doesn’t take much to entertain Jenny or myself. So with our yellow convertible appropriately nicknamed Sunshine, and a couple of cheap beach chair rentals, we had ourselves a vacation. It was fun and relaxing and overall a really great time. Conference wasn’t as good as I hoped. But maybe we’ve just been spoiled. I’d say that I have a bit of an issue at times when it comes to worship through music. My issue is that when it’s bad music, I have a hard time focusing. I know that it shouldn’t matter and I hate it about myself, but truth of the matter is, if the worship leader can’t seem to sing on tune then I really lose my focus. One of the bands that led is from the church there in California. I’m sure he’s a nice guy. I’m sure he’s sincere. When he sings straight as music is written, he at least sounds average. As soon as he deters from that at all though, as soon as he adlibs or tries to just follow the Spirit he completely lost all quality of tone. He was just flat out WAY OFF. So I’d find myself completely focused, singing along, and then wham- what in the world is that noise?! I know it’s all music to God, and it’s the heart that matters, and that maybe I’m the only person who struggles with this… don’t get me wrong, I’m not saying that if you’re not a good singer you shouldn’t worship in song. I just have a hard time listening if you choose to LEAD. I think maybe your gifts lie elsewhere… Like I said, I know it’s not a good thing that I get distracted by it- and I didn’t say I liked this about myself. Ahh well what can you do. I was thinking yesterday about how blessed I am by my friendships. A really close friend called just to see what I thought about something that happened to him and I realized how much I appreciated him. I probably don’t tell him that often enough. He’s engaged now and getting married in the fall so the relationship has changed (as it logically would) but I still really appreciate him and absolutely adore him. We’ve known each other for almost 8 years now, and been close friends pretty much from the start. Funny how you stay connected even when the middleman sometimes fell out of the equation. It’s crazy that we’ve never even lived in the same town. I’m looking forward to his wedding. I love the girl he’s chosen and I love to see that he’s happy in his life. It was an honor to be asked to be in his wedding. Means more to me than he probably knows. Well what’s an entry without a little musical discussion. I’ve been listening to a couple of new things lately. One being Jamie Cullum’s Twentysomething. In particular I love All At Sea. It's fun and jazzy. I’ve also been stuck on the Mindy Smith song “Come to Jesus” from the album One Moment More. I have yet to listen to the rest of the CD b/c I’m stuck on this song, but from first skip through I’m not impressed. It was worth the purchase just for the one song though. It’s got an eerie sort of desolate feel to it. It’s great. And the last song is the Brad Paisley/Allison Krauss duet “Whiskey Lullaby”. Goodnight this is a SAD song- but WOW! I just love anything she sings and this song with all the minor chords and heartwrenching lyrics- wow. Anyway, so that’s been my recent music choices (recent as in within the last week). Filming began on the remake of Charlie and the Chocolate Factory with Tim Burton and Johnny Depp. :) Even without music, with those two I'm pretty excited about it. I think I should stop writing before I think of something else to ramble about. Maybe I should write more often so this isn't an issue.